For a little while, way back before many of you were born, comics’ premiere justice-dispenser Judge Dredd was both “the law” and “a werewolf” in a story arc called “Cry of the Werewolf”. 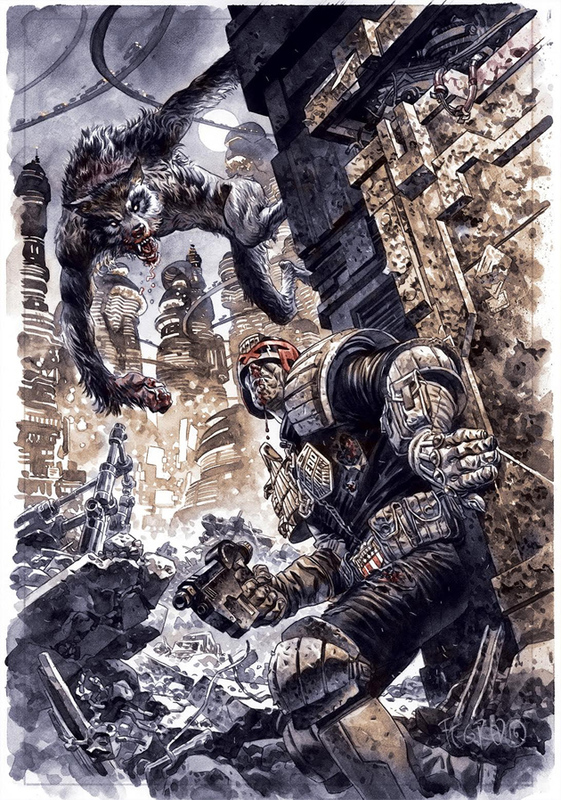 Fast forward over three decades to March 2017: writer John McCrea and a handful of artists will use an IDW Deviations one-shot to explore what might have happened if Dredd had never been cured of lycanthropy. In March, IDW is launching another five-week Deviations event, and it’s kicking off with a Judge Dredd story [“Howl of the Wolf!”] where the always amazing John McCrea asks what Mega City One would be like if its toughest lawman had never recovered from that time he was briefly a werewolf. So what’s the provenance of this alternate-reality sequel’s story? In 1983, writers John Wagner and Alan Grant, letterer Tom Frame and artist Steve Dillon turned Mega City One’s massively-chinned lawman into a lycanthrope for seven issues of 2000 AD. 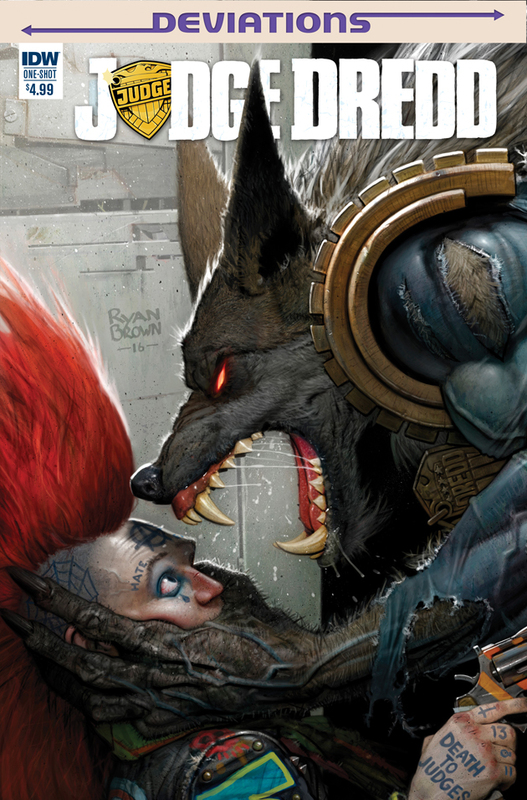 “Cry of the Werewolf” was regarded as one of the better “Dredd versus the supernatural” stories and it got the stand-alone collection treatment in 2012. 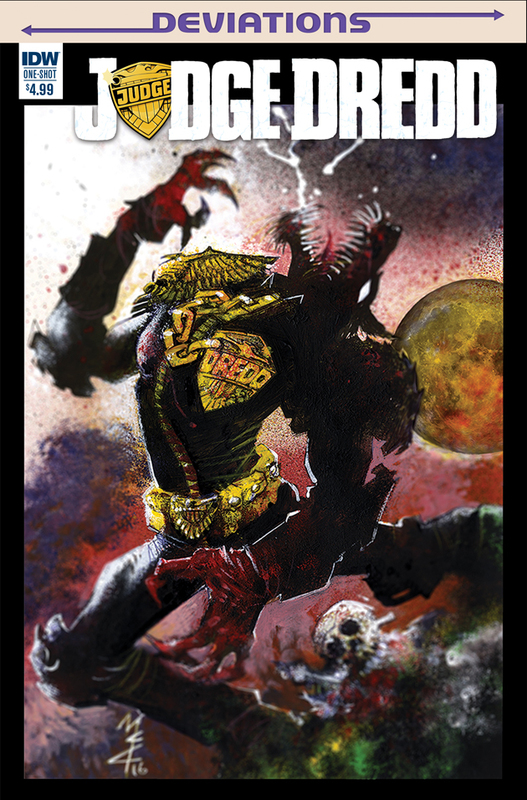 Now, in light of Dillon’s recent passing and the imminent release of Judge Dredd: Deviations, IDW is also reprinting that original story along with some extras, for a good cause. …IDW will be reprinting the original “Cry of the Werewolf” with a new version that serves as a tribute to Dillon, who passed away in October. In addition to the full story, IDW’s version will include a section of pinups from artists like Duncan Fegredo, PJ Holden, Jock, and more, and a portion of the proceeds will be donated in Dillon’s name to his favorite charity, the Hero Initiative. Both comics will come out in March 2017 and will feature a ton of great werewolf art, like this post’s feature image, Ryan Brown’s variant cover for “Howl of the Werewolf”. My exposure to Judge Dredd is limited to 2012’s Dredd, a film (and soundtrack) that I will never ever get tired of, but as with so many other things, add werewolves and you will get my attention and my dollars. Thanks t0 KSFWerewolf for the link that sent me down this rabbit hole.